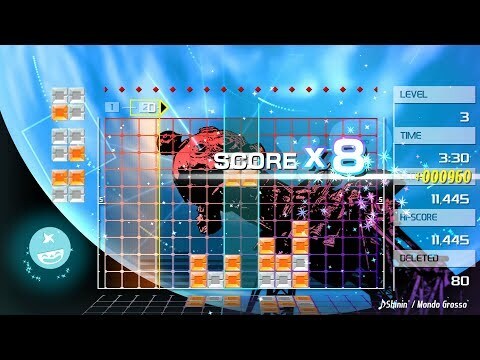 Lumines Remastered is an HD remake of the original Lumines (pronounced “lou-min-es”) that debuted in 2004 as a PlayStation Portable (PSP) launch title. Earning high praise and awards, it remained the top-rated title on the platform for four years and continued on to establish an action-puzzle series loved by millions of players. This is the franchise’s debut on a Nintendo console. Developed by Japanese studio Resonair, Lumines Remastered brings minimalism to the puzzle genre where the fusion of light and sound sets the stage for a two-color falling block experience playable on-the-go on Nintendo Switch or at home in 4K on PC and consoles. Groove to electronic jams while strategically dropping blocks before the BPM bar sweeps combos clean after each measure. It’s a stylish game perfect to play anywhere or at anytime. Lumines Remastered was released on PC, PS4, Switch and Xbox One 302d ago in the US and the UK. Notify me when Lumines Remastered is available.